GM's Advice: To Tribe or Not To Tribe? Your "tribe" is essentially the kind of creature you are. In the Final Fantasy universes, the kinds of creatures that go on adventures and become heroes are very diverse. While most tend to be humans of one stripe or another, some are genetically altered humans, or half-human creatures, or humans from the moon, or creatures who think they are human, who are actually manufactured somewhere. Some are more diverse: intelligent canines, stuffed toys, moogles, bangaa, humanoid animals (wolves and pigs, for insance), entire races of fetish models (cat girls and bunny girls), plant-based war-like little folk, clown people who live in swamps, ancient spirits of the earth, etc. Even in games that have had human or mostly-human characters, there has been a diversity: ninja people, children, old folks, insane farm boys, orphans of destiny, ancients, and wandering assassins. What all of that shows is, essentially, that any rules for your tribe have to be very diverse, and very open to interpretation. They have to be able to accomodate both a desire for diversity, and a desire for concrete mechanical effect. The rules need to be simple enough to handle almost any character concept, but also allow for distinction — a Galka that plays the same as a Yuke who also plays the same as a robotic stuffed toy is not going to deliver much rewarding diversity. To that end, your tribe is essentially a specific kind of archetype. The mechanical effect a tribe has is the same that an archetype has. Like an archetype, you can create your own tribe, or introduce a new tribe, or take a different perspective on an existing tribe. The use of tribes is also optional. You don't have to use any tribe abilities or effects to get a diverse character. Below are the basic guidelines for a few existing Final Fantasy tribes replacing your archetype. This replaces your archetype choice — choose either a tribe or an archetype, not both. Customizing: Not all tribe members are the same. If you want to adjust the base statistics that your tribe assigns you, feel free to add one to a score, and subtract one from another. Do this only once. A vaguely reptilian tribe hailing from the deserts, the bangaa are physically imposing, tall and powerfully muscled, with sharp teeth. 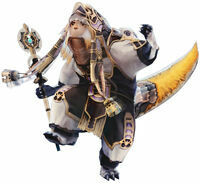 Sometimes considered dull and thuggish, the bangaa are nonetheless a proud race, who scorn being called "lizards." They are also quite religious, with monks, templars, and other divine figures featuring prominently in their cities and villages. Clavats are creatures of the earth and land, farmers and ranchers close to the crops they grow. They are friendly and outgoing, and make friends easily, being social and dependable allies. Some characterize them as being slightly backwater, ignorant of the wider, busier world, but many clavats just enjoy a slower pace to life, living a life of leisure from day to day rather than trying to achieve something grand. To a clavat, a healthy family is miracle enough. Elvaan are tall, strong, noble creatures who excel in physical combat and in the celestial arts of holy magic. They crusade against darkness and wickedness, but are known to be condescending, overly stuffy, and very formal. They have a very high opinion of their own culture, and have, in the past, attempted to impose this culture on others around them. They are lead by a high priest and a hereditary monarch, and revere the social order represented by these two pillars above all. In lifestyle, they are spartan and austere, bred for a life as a military warrior. The galka are an unusual race of hulking, vaguely ursine humanoids, powerfully muscled and blessed with fantastic endurance. They are enlightened and spiritual, creatures of great insight into history and the land. The reason for this is that they are a reincarnated race, creatures who do not die, and are not born, but rather fade away into a beam of light, only to be re-formed in an isolated area, born wandering fully developed (though young). Galka cannot remember their past lives, with the exception of a single spiritual figure called the "talekeeper." Despite their enlightenment, galka are easily misunderstood, and their powerful physiques are often abused by those around them, leading them to be quick to anger and fury. Many galka have abused the physical power the gods have given them in a fit of pique or rage, and a few civilized races see them as nothing more than barbarians, monsters, and animals, fit to be slaves and gladiators, for work and amusement. Lilties are fiery-tempered and physically powerful, but rather small-statured. They have mastered the arts of war and metallurgy, which, in ancient times, lead them to build an expansive empire that directly competed with the empire of the Yukes. However, they grew too fast, and when the main mine of their empire ran dry, they could no longer outfit their brash warrior garrisons with weapons and armor, leading to the decline of the empire. They remain very proud of their heritage, and still make exceptionally effective warriors, but can be a touch hotheaded. The mithra are a race of feline hunters. Hailing from distant and unreachable islands, the ones found in the common lands are rebellious females, adventurers by necessity who have been forced to eke out a living far from their own homes. Playful and high-spirited, mithra are nonetheless rather covetous of what others have. This, along with their feline speed and reflexes, makes them good thieves, but sometimes rather envious companions. They are playful and energetic, with a love of prank and mischief that the tarutaru they have allied with seem disturbingly fond of. The mithra tend to be bold where the small mages are timid, though many mithra seem rather preoccupied with grabbing the land of these small allies for themselves. 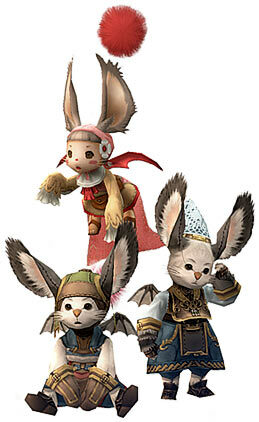 Moogles are playful, clever, adaptive little creatures, handy with machines and in touch with the spirits. They are small, looking something like teddy bears with white fur, bat wings, and a brightly colored "pom pom" sprouting from their heads. Nu mou are a squat, vaguely canine people, with long tails, and long, drooping ears. Sagacious and long-lived as a people, they are removed from many of the events of the world, though occasional individuals may enter. They are magickally powerful, weaving all types of magic along with many of their own unique forms. They are also known to be skilled commanders of monsters, recruiting the beasts to fight for them when magick simply will not do. Rugged individualists with a larcenous streak, Selkies are a people from the sea who travel with the tides, and in the streams, rivers, and lakes of the world, bartering, stealing, and doing what they can to get by. Many other tribes look down on the Selkies as selfish and untrustworthy, and they rarely put down permanent roots in any settlements, though a few have allied with the Clavat villages. They hunt and fish, living a mostly wild lifestyle, and for this many get called "no better than beasts." The tarutaru are childlike beings of immense magickal power, who weave the elements of the world together in their small frames, mastering it, and unleashing it. Their control of destructive magic has lead them to great victory on the battlefields, though they seem to have a powerful innate fear of the world around them, which stops them short of becoming an imperialistic magickal armada of doom. Still, when they overcome this cowardice, and set out into the world around them, they can be unsettlingly effective killers, making the sensation of dark magic all the worse with their baby-talk rhyming speech habits and their childlike tittering laughter. 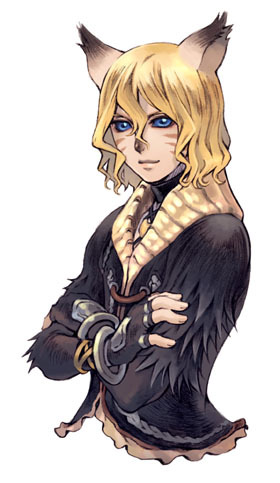 The viera are an aloof race of slightly rabbit-like humanoids, with long, furry ears, long feet, and a keen sense of the spirit world. Lithe and quick, they are adept at moving through their arboreal homelands, and remain in deep connection with the life that exists in the world all around them. They are generally bound by strict codes of behavior, and rebels who defy these codes are those normally found in other lands. Viera males do exist, though they are quite rare, and are kept even more apart from the common mortal realm than the commonly encountered females. Yukes are ethereal, scholarly beings, creatures of air and magic whose bodies have gradually been sacrificed to their arcane arts, leaving them shriveled and vulnerable outside of their elaborate mystical gear. They are masters of the arcane arts, and travel the world teaching the mastery of magic to many other tribes. In ancient times, their lands were threatened by the Lilty empire, but the empire fell before the Yukes were destroyed, and now a sometimes-uneasy peace exists between the two. Yukes can be obtuse and overly wordy, taking delight in the arcane machinations of language, just as they do in fashion, and in magic itself. Because tribes are fairly abstract and can vary a lot between games, making your own tribe is as easy as making your own archetype, but is generally more in the GM's hands than the players'. Most tribes in the game fit four broad types: the Strong tribe (usually poor at magic), the Fast tribe (usually unable to take many hits), the Magic tribe (usually not very strong), and the Tough tribe (usually pretty slow). You can choose to follow this model, or directly violate it, in your own games, as it is hardly written in stone. Regardless, the essential tribe-building process is the same. All you need to do is assign base statistics, trading off a bonus in one stat for a penalty in another. Thus, if you have a tribe that has a +2 Vigor, then you should give that tribe a -2 in some other stat (if you're making a classic Strong tribe, you might put it in Intelligence). Generally, you shouldn't deviate from +2/-2, since bigger variations might make the tribe limiting. Any tribe with +4 in one stat and -4 in another stat is going to be very narrowly selected to do one thing and to avoid that other thing like the plague. This creates a very binary tribe, who can excel at one thing, but who can't contribute in others. Generally, this isn't a good idea, since no one has fun sitting out an encounter (or being so dramatically shown up in another that they don't remember why they participated in the first place). Tribes follow the same rules and guidelines as archetypes and are expressly called out as optional. But how you use tribes in your game as a GM actually says more about your game than many other aspects of your game. So how do you decide to use tribes or not? And if you use them, how do you decide how to use them? The first decision should be the overall "Final Fantasy feel" you're going for as a GM. If you're evoking a particular FF world, you should follow the guidelines for that world. Ivalice, for instance, has a large number of humanoid races, and travel to new regions should almost always include one or two, even if the PC's never get to be one. Meanwhile, worlds like Vana'diel and the world of Crystal Chronicles have different races, but these races are largely world-wide (or at least region-wide), and so you don't often meet characters who aren't a member of races that the PC's don't know a thing or two about already. To the other extreme are games more like the older Final Fantasy games, where the protagonists are all (or almost all) essentially humans, even if they are very special humans of some sort. Even in those games, of course, there was a cultural distinction between various humans — pirates and princesses and ninja-clans and wanderers and interdimensional travelers and Ancients and people from the moon, all of which may have a distinction, though archetype may be enough for that. The second choice is a little more subtle. 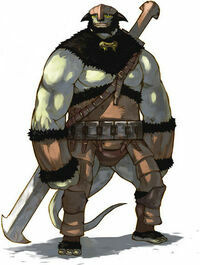 If you're not using a particular FF game as inspiration, you should figure out how "monstrous" you want your world. In general, the more similar the possible PC's, the more monstrous and alien things that are "not-PC's." By defining what the players can choose to be, you're partially giving them a clue as to what "civilized" peoples are accepted in the world. If everyone in the party must be human, then even something as relatively common as an elf or a dwarf can become very exotic, never leaving their forests or their caves, experienced only as rare allies or as actual adversaries. This creates a very "monstrous" world that resonates more with old myth, where anyone not of your particular town may as well have been a horrible beast, and where fear and darkness run up against islands of civilization. If, on the other side, you have a lot of tribes and a more "open door" policy for new tribes, then your world will feel relatively cosmopolitan. Creatures that look different than you are to be accepted and respected for their own talents (though they may be different than yours). Even a goblin or a ghost may be a potential ally, and the differences are more about individual people than about broad swaths of "monsters." Most games fall somewhere in the middle, and, as a general policy, you should be accepting as a GM. However, don't be afraid to tell a player that they can use all the mechanics of their tribe, but that they are human, if that fits your world better. Tribes are also an area where you can be proactive as a GM, designing tribes that are a fit for your particular world, to make it distinct. In this case, you might have only one or two (keeping the world pretty monstrous), or you may open it up to everything in these documents plus any player ideas (making thew world very cosmopolitan). Generally speaking, 5 (four tribes including humans) is the magic number for PC selection, but since your character focus doesn't depend on your tribe in any game, even that quantity isn't necessary for variety. 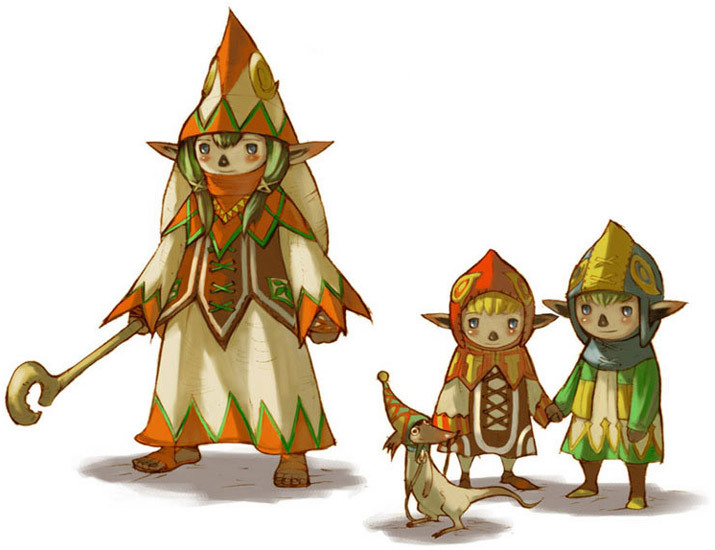 Tribes are an optional rule, allowing for campaigns where tribes play a key role (such as campaigns using elements of Crystal Chronicles, or Vana'diel, or Ivalice). But tribe doesn't play a key role in every game, and some of the most diverse party members occur where there is, essentially, no tribe distinction any greater than the already-existing character distinction. In FFVII, for instance, the difference between a robotic stuffed animal and an intelligent canine is more about the job they have (gambler vs. berserker) than about what they are, inherently. It is possible to follow this latter model, if you want to have tribes, but not bother with a major mechanical effect. You can assume that the chosen stat array for the character is within the "typical" range for a tribe, and that the feat chosen at first level is the tribal bonus feat. You may want to throw in special job options for the character, different than the typical job abilities, but demonstrative of what kind of creature the character is. You can also assume that the existing job abilities are tribe-dependent: if the character wasn't a Bangaa, she wouldn't gain these Breaker abilities. This means re-concepting much of the game, but it allows you to be very flexible in the types of creatures you permit: the remote-control stuffed animal robot can easily be a part of any party without needing its own unique, individualized rule set. Following this guideline is not dramatically different from creating a highly personalized character. It can require a lot of GM involvement, if you would like that character's tribe to mean something and be unique, but it doesn't have to: sometimes, all you need is a little psychological shift. In many ways, tribes and archetypes are the same thing, and you can use the rules for them more or less interchangably. Tribes are essentially archetypes with some game-world weight behind them: they are cultures and families and peoples, not just broad ideas. You can treat tribes simply as different archetypes. To do this, simply remove the physical association of the tribe — the Bangaa becomes simply a stat base, rather than a reptilian humanoid. The base stats will give you a Bangaa-like character build, but you don't have to be a member of the Bangaa tribe to have that kind of character: any hume (or any other creature) might have those stats. Similar to the advice above, you can treat tribes simply as key flavor for the character. In this model, your tribe, like your archetypes, is vital and important, but has no direct mechanical effect, rather guiding your character as it is created and advanced. If "Clavat" is an archetype, you would expect the character to have a sword and a shield, to be friendly and outgoing, to look a little childlike, and to enjoy farming. If your character hapens to be a magick-casting heartless mercenary who only eats raw meat, that's no different from playing "against archetype:" it doesn't affect your mechanics, but you will be looked at with surprise and shock, especially by people who know your usual tribal archetype. Alternately, the flip side of this is to treat the archetype as your tribe. This is something like taking The Strong One and turning it into The Strong Tribe.